905ArtTalk: DIY screen-printing - This week! Focusing on the entire process of screen-printing, the demonstrations will cover every aspect of the print-making process from drawing the initial designs to the finished product. 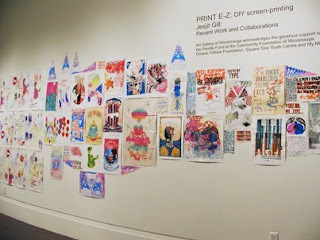 Do-it-yourself and join the exciting assembly line of poster art production. An exhibition of Jesjit Gill’s recent work and pieces resulting in the collaborative efforts of the participants from the Square One Youth Centre are on display at the Art Gallery of Mississauga until September 9th. If you have any questions please contact Suzanne Carte-Blanchenot at 905-896-5507 or suzanne.carte-blanchenot@mississauga.ca.